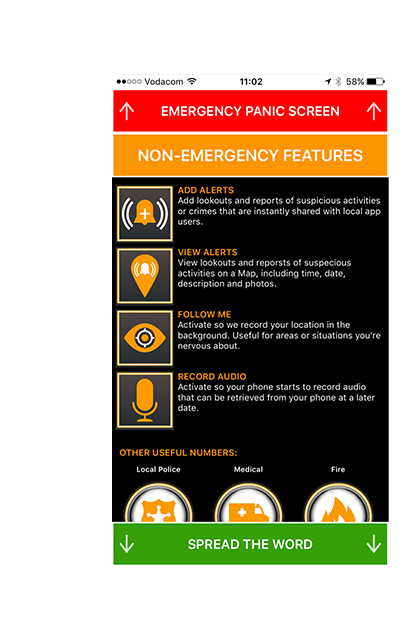 The free Bull Horns Panic Button app allows you to instantly, silently alert your community and emergency responders with just a shake of your phone. You can also add and receive notifications about local crimes and suspicious activities. The new responder feature will automatically notify the closest available response vehicle - like an "Uber for Security. 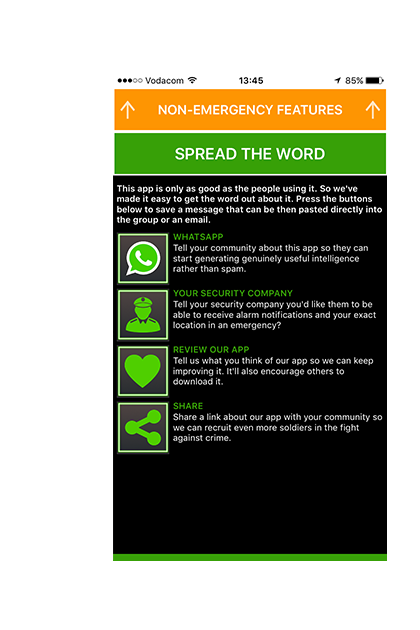 The Bull Horns Panic Button app turns your phone into a panic button that will instantly, silently call, send notifications and SMS your emergency contacts. Now your security company (if they partner with us) can see your exact location in realtime and their nearest available response vehicle will be instantly notified and so can proceed towards you. You can also add and receive alerts of local crimes and suspicious activities in your neighbourhood. With one-touch on your phone, smart watch or headphones your phone will call and SMS your emergency contacts. Let your armed response company see your exact location in real time (if they partner with us). Contribute and receive instant alerts from your local community about suspicious activities, crimes, scams, trends. A lot more structured than WhatsApp chats. If you are going into an area or situation you are nervous about, leave a breadcrumb trail so people can track you. Add your details, the details of your security company, your emergency contacts and your preferences. For example you can opt in to receive alert notifications for crimes and suspicious activites reporting within a range (you can select the range). The panic button is active. When you press it, it will start to call your emergency number and also send an SMS to your emergency contacts showing your location. If your security company partners with us, their control room will get an alert with a link to your details (including photo) and exact location in realtime. We recommend you test the app as soon as you download the app to understand how it works so you can trust it in an emergency. You can add crime alerts by completing a short form including photo, location, description and the category. This will automatically send notifications to other app users nearby. You can view a map of all alerts and click on the icons for more details. You can also allow the app (and your security company, if they partner with us) to follow your location without activating the panic. Tap on the microphone icon to discretely start recording audio that can be retrieved later. Tap the "Local Police" button to call the closest police station (SA only). 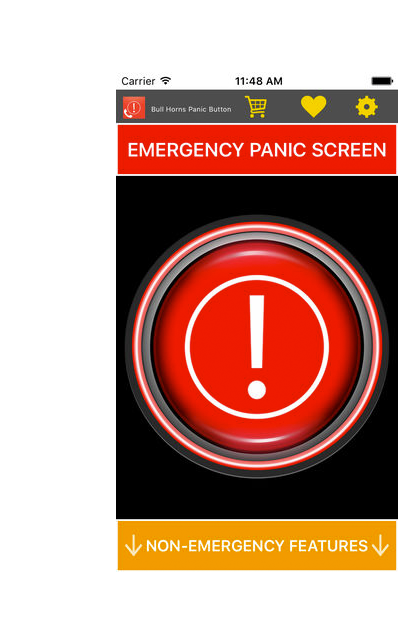 You can now activate your panic button with just one tap from your Apple iWatch or Android Wear smart watch. Just install the app on your linked watches. You can also activate the panic button on your Android phone by pressing the button on earphones that are plugged in. These great new beta features are designed to make it easier to get help, especially for runners, cyclists, the elderly even just when you're asleep at night. You can activate a panic by shaking or dropping your phone or by tapping on the app icon. The app knows the location of the closest available responder and instantly contacts it. They receive your location, phone number and photo. Their control room also receives and alert to coordinate the response via live responder tracking. The latest version of the app enables us to easily partner with private security companies so they can protect their clients better. When your clients activate the panic button on their phone (which everyone carries on them and has on next to their bed at night, unlike traditional panic buttons) their phone will call you. Simultaneously you'll get a desktop alert in your control room (requires only internet access). You will be able to track their exact location on a Google Map, even if they can't speak or are on the move. This provides you with a competitive advantage and also enables you to support clients outside of their home. We'll even build you your very own app. For more information on the benefits and pricing contact us today about joining as a partner or getting your own version of the app. Ongoing (total per month, ZAR). This is the wholesale price charged to the security partner. Pricing excludes VAT if applicable. Get you own app has an additional once-off development, hosting and license fee of R11,490. The minimum agreement period is 12 months. We can provide a full partner agreement for your information. Subject to annual review but should only increase in line with inflation. Must be paid in full by beginning of month. We can only allow a limited number of companies to join our app (option 2) at any given time and can only do so as part of quarterly releases so please express interest sooner rather than later to avoid delay. If you are interested in testing the product for free using our dummy security company log in details (so you can test the information received by clients when users enrol and activate), please just let us know. We would also like to come and demonstrate how the app works in practice as well. "You can’t help but love this App This is a brilliant idea... we love seeing South African Companies taking initiative of this nature. This is brilliant, very useful and effective. One, if not the, best apps in South Africa right now." "Makes me feel a lot saferI really like this app. Simple but well-designed and does the job. I can let my security company and the guy on patrol know immediately if I need help from my phone. Hope I never have to use it for real but it gives me great peace of mind." "Great app. I now feel a lot safer "
"Very cool. A lot of potential. It definitely makes you feel a whole bunch safer with this next to your bed at night. Awesome idea guys! " "Just downloaded it already feel safe hope it works as u promised thankx for keeping our homes safe "
1. Why does the app require all these permissions? 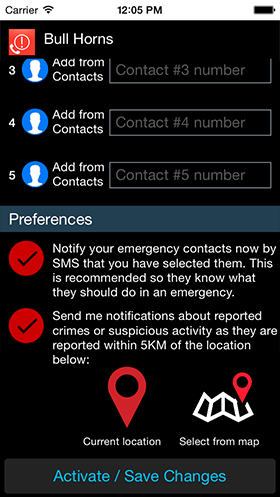 Contacts - When you add emergency contacts, you can select them from your existing contacts. Location - When you activate the panic button or the “Follow Me” button, the app can tell your contacts and security company (if they partner with us) where you are. It is also used when you want to add home location or location of crime alerts. 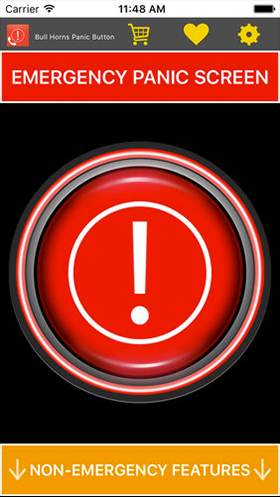 SMS - When you press the panic button it will send an SMS to your emergency contacts showing your location. It will also send SMSes to contacts when you cancel the alert. 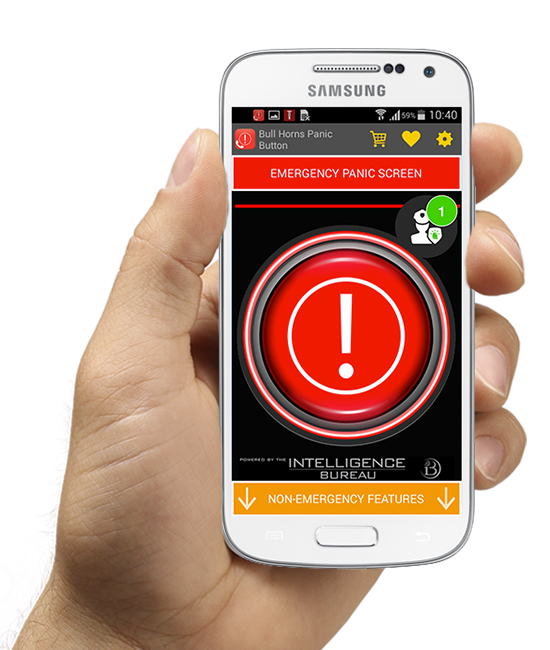 Phone - To make phone call to your emergency contact when you press the panic button. Photos/Media/Files - So you can add a photo of yourself (at registration) or a crime (when adding an alert). The app never does this in the background - you must initiate this. Microphone - To record audio when you press the “Record Audio” button only. 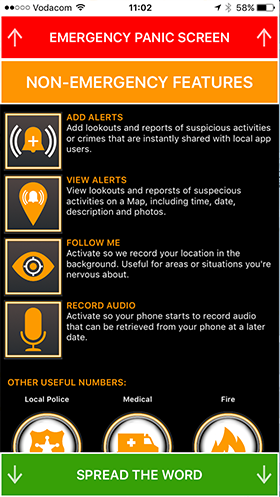 Data - The main way the app uses data is when you press the panic button or follow me button (to send a small data alert to the backend database), at registration and adding crime alerts (to save details to the database), to use the map (e.g. to find your home location or crime locations) or to use the online shop. Identity - So Google Play knows who has downloaded it and so users can access across devices.  Device ID and call information - Device ID so we can synchronise your app details if, for example, you delete the app and re-install it. 2. What does the app icon at the top of my screen mean? Is the app using data or GPS in the background? The app doesn’t use services (such as GPS or data) in the background. It only does so when the app is open and active. The app icon at the top of the screen on Android phones only indicates that the app can use the earphone jack. It has nothing to do with data or GPS. 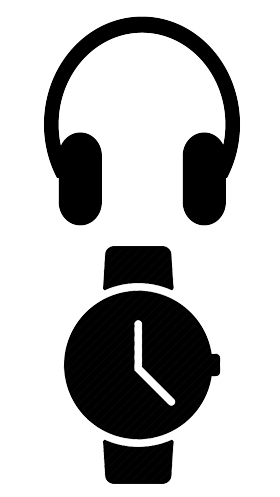 This is a new feature whereby you can activate the panic button by pressing the media button on your earphones.  © 2016 App Developer Studio. All rights reserved.